Our goal is to offer a variety of classes to meet the diverse needs of owners and their dogs. In doing so, we hope to help you achieve your individual training goals. Class length varies from 30 to 45 minutes depending on the level of the class. Beginners: Basic obedience skills are introduced in a fun, low stress atmosphere. Brush-up Classes: These classes are designed for older dogs who are ready to move on to more specific exercises such as heeling, focus on handler, stay, and come. Open and utility: These classes provide higher levels of obedience. 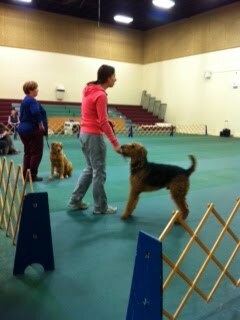 Trials class: Prepares members who are interested in participating in competition obedience. Please feel free to contact us to find out more information about which class would best suit you.